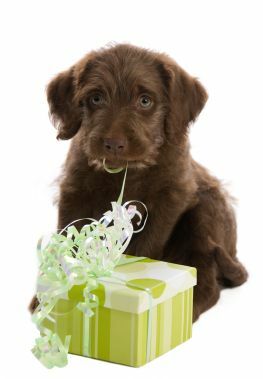 Dog Gifts: Is there ever a reason not to give (or get) one? No way! Gifts for no reason at all are sometimes the best ones. New Puppy - They will need lots of dog training treats. Thank You - Give thanks to your groomer, vet, dog walker or pet sitter. Get Well - Know a dog who just had surgery or other procedure? They'd appreciate a special treat just for them. Seasonal - Why not embrace the changing seasons with a corresponding treat. For Spring you could have treats with fruit and vegetables that are in season. For Summer cold or frozen treats hit the spot like no other. For Fall you can't go wrong with pumpkin or turkey treats. And for Winter you'll want to make some warm, hearty and comforting, treats. So, you've tested your skills as a dog treat recipe baker, and now you're ready to share with your family and friends. Or, maybe you've learned about healthy, all natural or organic ingredients and want to give a special dog a special treat. Of course, you can always toss a few homemade dog treats in a zip lock bag, but why not make it a special gift with a little pizazz. You found a great dog treat recipe, and you know just the dog who would love a taste. This is a perfect opportunity to create your own dog treat kit. Include the recipe, a cookie cutter, and the dry ingredients. You could package up the dry ingredients and place everything in a new dog treat jar. Really, you can make it as fancy as you'd like. Gift giving can be as much fun for the recipient as it is for the giver. In turn it makes others want to give and so the happiness continues to spread. Who knew all of this could happen because of a few healthy or homemade treats as dog gifts!